The Dreaded Vole or so called Meadow mouse or Field mouse can cause extensive turf damage under extended snow cover . As we all know each spring every home owner with a lawn has Vole damage. But just imagine if you had a front lawn that covered over 115 acres! Well that is what we have to deal with every spring on the golf course. Most of the damage that the Vole creates is in our rough where deep snow lingers in pockets most of the winter. 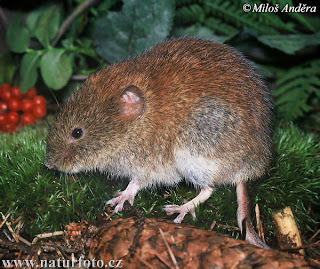 The Vole eats a variety of plant life but mostly grass, and they do not hibernate they stay active all year. We typical see the most Vole damage in the spring when the snow melts. This damages resembles a surface runway or burrow system with many burrow openings into the ground. Once the snow is gone it is time to get out and repair the turf that is damaged . One of the things we do is to rake up the entire area that has damage and fill the runways with a soil seed mixture. Be sure to do this in late March or early April when we have some good moisture in the ground. This will give the seed time to germinate. One of the only ways to prevent Vole damage is to map out the areas every year to see if there is a pattern. If a pattern starts to develop a simple application of a organic rodent repellent, Capsaicin ( the hot in chili) or Zinc phosphide in late fall before snow cover will help that area. The problem is that patterns year to year change because our snow cover can be different every winter. If you have the time and energy traps work as well ( good luck). In the end this small rodent is one of those creatures we just have to deal with and hope for the best when spring arrives.